Ruba Nadda spent most of her early life living in various parts of Canada. Her family moved to Lynn Lake, Manitoba then Tumbler Ridge B.C., then to Elliott Lake and Woodbridge Ontario. She and her family also returned to Damascus, Syria a few times before finally settling in Toronto in 1989. Nadda studied Literature at York University and was accepted into the Tisch School of the Arts, at New York University, where she completed a summer film program. When she returned to Toronto she began to make films. Most of her films have been shorts ranging between 1 minute and 20 minutes with most of them running 3 to 5 minutes. Her first feature-length film was 2000’s I Always Come to You. 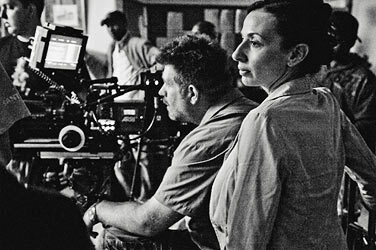 Pictured above: Luc Montpellier (Director of Photography) & Ruba Nadda at work on Inescapable. Photo by Thomas Birkett.